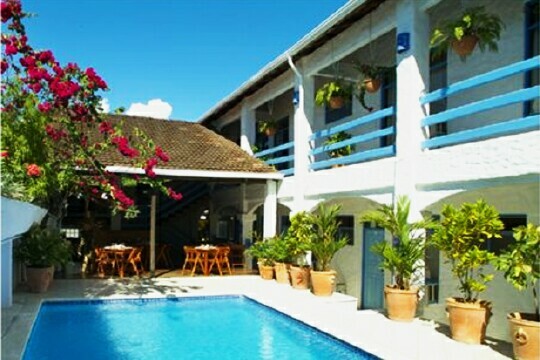 Welcome to La Sirena Hotel, conveniently located in the center of the town of Quepos, on Costa Rica’s Central Pacific Coast, just a 25 minute flight or 3 hour drive away from San José. The hotel offers 14 lovely rooms with air conditioning, cable television, mini fridge, telephone and digital safe. The onsite amenities which include a tour office, laundry services, swimming pool, and tiki bar are some of the reasons why they were voted the Best Value in Costa Rica by the Keating Leisure Associates. Years ago Quepos was a sleepy little port known for its banana plantations and small port. Since then much of the primary forest area was purchased to form Manuel Antonio National Park, which in turn was discovered by a small group of travelers from the United States. They opened a bar, then a hotel and the rest…as the say…is history. In the coming years the waters were discovered to be filled with Sailfish as well as other sportfish. Quepos also became a jumping off point for adventurers heading to the unpenatrated jungles of the southern part of the country. The historic wooden homes of the banana company still overlook the port. Today, Quepos is known for its fishing and diving fleet as well as its many adventure tours. Your stay at the newly renovated La Sirena hotel puts you right in the heart of Quepos’s Marina District within easy access to everything, including its eclectic mix of international travelers. The friendly and bilingual staff is well familiar with all the different tours and adventures that are available in and around the Quepos/ Manuel Antonio area and can assist you in making the most of your stay with them.